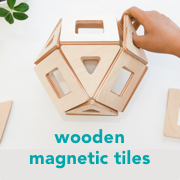 I hope that it doesn't need saying that there is more to Montessori than toys and materials and that a Montessori home can be created on any budget. But it would be amiss of me not to share or discuss some of our new finds or favourite materials. I had seen this stacker before but it wasn't until I saw a similar one at Honeybee toys that I thought how wonderful it would be for Otto. We love this new toy so much I'm naming it our toy of the year! It is a large toy so it may be a good option for Christmas or first birthday. Wooden - made of natural materials. It is warm to the touch and looks lovely in the playspace. This also makes it compostable/biodegradable. Gross Motor Skills - it is so large it allows the child to exercise their gross motor skills, there is lots of up and down of the arms and moving around. I can see in these images that Otto is activiting his core and moving his arms above his head. 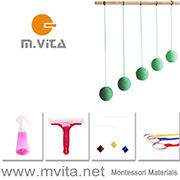 Coordination - the child needs to thread the wooden discs onto the large dowel require coordination. Visual Discrimination - although for Otto this will be in the future, the stacking nature of the discs allows the child to stack them in order of size. Maximum Effort - the discs are quite heavy and to get them onto and off the dowl requires the child to use maximum effort. Concentration and Repetition - this activity has fully engaged my child allowing for concentration and repetition. Calls to the Child - this stacker calls to the child, I can see that it is attractive to the child in this stage of development. Appeals to all Senses - this toy is nice to touch, it feels heavy and has weight, it looks warm and lovely, it also makes a satisfying sound as the discs are dropped (or lowered) onto each other. Positioning Schema - child in the positioning schema will like to sack and unstack materials, I can't help but think this appeals to children in the transporting schema also as there is lots of carrying the discs back and forth, and and off and around the playspace. "Observation shows that at the age of one and a half a new factor appears of great importance to the development of both arms and feet. This is the development of strength. The child who has become active and skillful feels himself strong... Instead of merely walking, the child likes to take very long walks and to carry quite heavy things." - Maria Montessori, The Absorbent Mind. Is this the biggest stacker you've ever seen? Our Giant Natural Stacker is from TTS (UK) we have the circular one, but this post is inspired by a similar stacker from Honeybee Toys (AU).